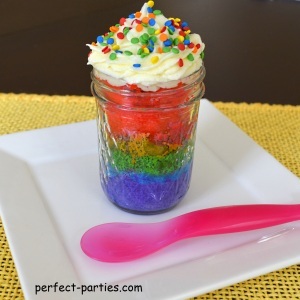 Cute rainbow cake in a jar with buttercream frosting and sprinkles. We saw this picture on Instagram and looked up a recipe to try it. We found a few recipes but followed Brook McClay's recipe but tried it in 1/2 pint jars. This makes a large one serving size with a total of 5-6 rainbow cakes in a jar. This brightly colored cake idea will be fun to eat at any party. It does take some time but the results are worth the extra effort! Use neon or pastel colors to match your theme. 1 tub of Buttercream icing or make your own. 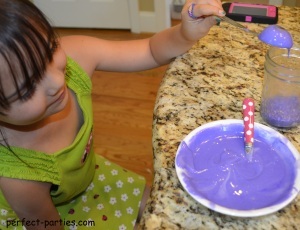 We used Wilton Icing Colors or you can use Neon Food Dye. Skewer to test doneness. A toothpick will be too short. 5 or 6 1/2 pint sized Mason Jars washed and dried thoroughly. Mix cake batter as directed on box. Pour about 3/4 cup batter into each dish. Add dye and mix thoroughly. Add more dye if you want colors to be more vibrant. Spray Baking Spray into each of the mason jars. Pour about 1 1/2 tablespoons of the purple into each jar followed by blue, green, orange, yellow and pink. This is the order we used. We used two tablespoons which resulted in filling the jar 3/4 of the way. You can just break off the top of the cake like we did but you may end up filling only 5 mason jars with enough batter. Jars should be filled about half way if you don't want to take the top off. I filled it about 3/4 and this is the result. I simply broke the top off until it was just below the rim of the mason jar. However we ended up baking only 5 cakes. Bake as directed for 30-35 minutes until center is cooked. Check by sticking a skewer into the jar and checking to see if it comes out clean. If there are cake crumbs on it, bake for another 3-5 minutes and check again. When completely cooled, add frosting. We made a simple buttercream frosting but you can just buy a tub of Betty Crocker Buttercream frosting or favorite brand. We liked the Wilton colors because we didn't have to mix two colors to achieve any of the colors. We started using a toothpick to add color as the box instructed but we wanted vibrant colors so we used the tip of a plastic butter knife to add the dye to the batter. Bringing it to a party? Cover with the lid and frost when you get there. 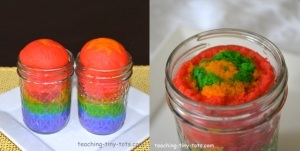 In one post I read it mentioned that you can even send rainbow cakes in a jar in the mail unfrosted. I found the mason jars at Target. The Wilton food dye was purchased at WalMart but they also have them at craft stores like Michaels.